U.S. monthly crude oil production in December 2015 continued to decline, as oil production reached its lowest level since November 2014. Production also declined from year-ago levels for the first time in more than four years. This continued production decline is the result of lower crude prices, which have declined more than 70% since the summer of 2014. 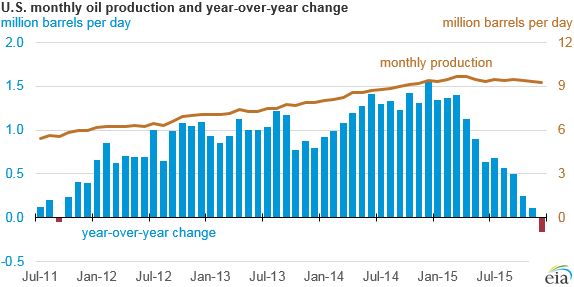 Crude oil production in December 2015 averaged 9.3 million barrels per day (b/d), down 166,000 b/d from December 2014 and the first year-over-year decline in U.S. monthly oil output since September 2011, according to the latest data from EIA's Petroleum Supply Monthly report released at the end of February. Domestic oil production has generally declined month to month since reaching a 44-year peak of almost 9.7 million b/d in April 2015. Even as production declined, output was still above levels from the same month a year earlier until EIA published production for December 2015. Most of the decline in oil production has occurred in states where a large portion of output comes from tight oil formations, including North Dakota, Texas, and New Mexico. Oil production from tight formations accounted for most of the increase in U.S. oil production during the past five years, and it is now making up most of the decline in output. EIA's Short-Term Energy Outlook forecasts U.S. oil production will continue to decline both on a month-to-month basis and from year-ago levels until the fourth quarter of 2017.